On the north side of my uncle’s sunken family room lived a magnificent, solid wall of vinyl records. It took a 10-foot tall library ladder to reach Aerosmith’s Toys in the Attic! That memory stayed with me my entire life. Decades later, he asked me if I wanted to inherit that vast collection. As tempting as that sounded, where do you put a two-ton stack of wax when you live in a deteriorating Craftsman from 1910? You put it on the back bar wall of Revolver! So...direct from my uncle’s man-cave to the turntables of Revolver, we offer this wealth of musical history along with additional and generous donations from amazing friends, patrons and family. What can be better than kicking back with a classic cocktail and listening to your favorite albums? 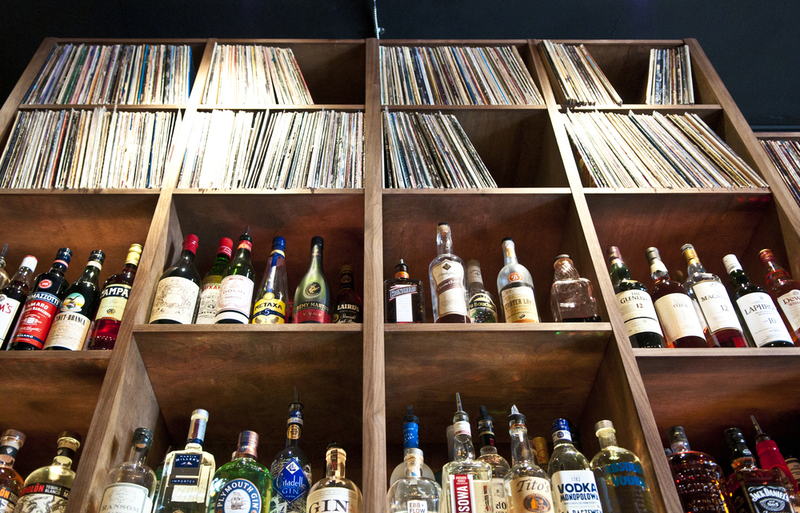 At Revolver, all we play is vinyl. From the best classic albums of all times to the hippest new artist. Sit back, order up some shareable nibbles and a bevvy and sink into an entire album side, the way the artist intended it to be heard. We are ALL VINYL, ALL THE TIME. Playing exclusively album-sides at a time. Revolver's massive vinyl library covers wide a spectrum of music—from 60's & 70's Rock, Soul, Early Country, Prog Rock, New Wave, Post Punk, Psych, Brit Pop, Shoe Gaze and everything in between. We host weekly DJ nights every Wednesday so check our Facebook page or Instagram for the latest guest DJ. Get the night started with your favorite Classic Cocktail. Local beer and cider on tap along with a great assortment of bottles and cans. Check out weekly specials and don't forget happy hour from 4-6 for sweet deals on beer, drafts, well drinks, house cocktails or a beer and a shot combo! Our menu is sure to please meat lovers, vegetarians and vegans alike. We offer several slider options, served in 3s and great for sharing. Seasonal and Caesar salads go great with the sliders. Want to share with your friends? Try our hummus plate or out-of-this-world garlic bread.